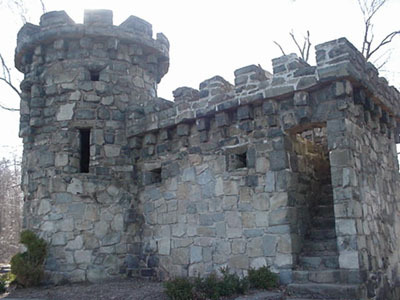 A short hike off Route 9W is the Federation Castle. It is located at The Federation Memorial Park in Alpine, N.J. near the New York boarder atop the majestic Palisades Cliffs. Accessible from Route 9W, by way of a foot bridge over the Palisades Interstate Parkway and follow the path for 3 tenths of a mile. Thanks to Rick for sending the photos.